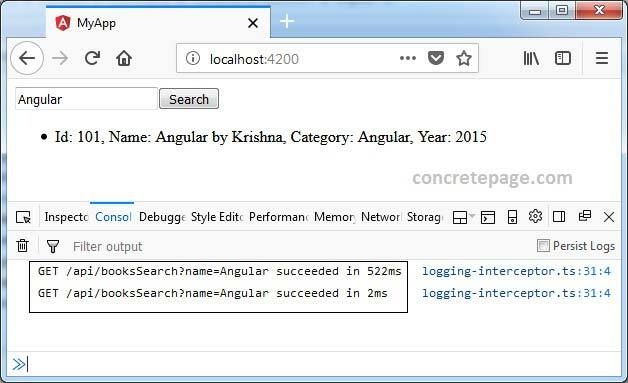 This page will walk through Angular caching Http Interceptor example. Angular provides HttpInterceptor interface that is used to intercept HttpRequest and handle them. HttpInterceptor has a intercept() method. To create an Interceptor, we need to create a service by implementing HttpInterceptor interface and overriding its intercept() method. There can be more than one interceptor in our applications and these interceptors run in the given order. Interceptors transform the outgoing request before passing it to the next interceptor in the chain. Interceptor passes the request to the next Interceptor by calling handle() method of HttpHandler. Here on this page we will create Http Interceptor to cache the response. The cache Interceptor first checks if the request is cachable or not. If request is not cachable then response is generated by running the request URL. If request is cachable then we fetch cached response and if it is null then we run the request URL to generate the response and it is also added to cache. We will expire the cache after fixed time. To store the cache we will use Map in our example. Now find the complete example step by step. We will create a cache service to get and put response into cache. For caching a response we are using Map. First of all we will create an abstract class to define caching operation. In the above class we have get() method to fetch response from cache and put() method to put response into cache. In our example, a cache entry will have following properties. url: Request URL whose response is to be cached. response: Response to be cached as HttpResponse. entryTime: Time when response is cached. It will help to find out expired cache. MAX_CACHE_AGE decides the age of cache. After this time, cache will be considered as expired. Now we will create our service to get and put cache using Map. 1. In get() method, we are fetching cached response from our Map for a request URL. If the result is undefined, it means there is no cached response for that URL, then we are returning null. If there is cached response for that URL, then first we check if it is expired or not. If cache is expired then we return null. If cache is not expired then return cached response. 2. In put() method, first we are creating cache entry with request URL, response and entry time. Then we set this cache entry into the Map. We also delete all expired cache. Now configure the cache service in provider as following. To create an Http interceptor we need to create a service that will implement HttpInterceptor interface and implement its intercept() method. In our cache Interceptor, we are processing following steps. 1. First we will check if request is cachable, if not then we pass request for next processing using handle() method of HttpHandler. 2. If request is cachable, fetch it from cache and if it is not null then return the response as Observable. 3. If cached response is null then let the request processed and then cache its response and return it. Now we will configure our interceptor service into providers of @NgModule. In our example we have logging interceptor and cache interceptor. Interceptors are executed in the order we provide. We have created const array of our interceptors. Search the book and look into the console log. Click the search button and wait for the output and after this, again click the search button without changing the search keyword. Look into the time taken by two consecutive search requests for same keyword. First time search is generated by running request URL and second time we get cached response. That is why time taken by first request is much higher than the second request. Cache will expire after 20 seconds.